I was checking out Y Combinator’s recent batch and was surprised (and elated) to see two low-temperature cookware devices in it! As someone working on a product in the space it’s good to see the segment of the market heating up. Pun intended. For those who don’t know, low-temperature cooking is a new(ish) method of preparing food. The old style of cooking (we’ll call it high-temperature cooking, for lack of a better term) had a good run. It had a near monopoly from the dawn of humanity until about ten years ago. The idea is that you throw food onto or into something much hotter than the desired final temperature of the food (a grill, a pan, an oven, etc.) and then pull it out when the center of the food has reached your desired point. For instance if you’re trying to cook a steak to medium rare (130F) you toss it on a 500F grill and pull it off when the center reaches 130F. The downsides to high temperature cooking are numerous. For one, it’s extremely easy to overcook your food. I’ll spare you the thermodynamics, but suffice it to say that while it may take 10 minutes to get your juicy rib-eye to medium rare, it may only take one more to get it to well and still one more to be burnt to a crisp. The chef must play what Modernist Cuisine calls “the role of human thermostat.” This is why you’ve probably eaten more food in your life that was overcooked than properly cooked. Worse yet, the heat in the final product is distributed unevenly. Even if you cook a steak to perfect medium rare, cut it open and look at the inside. You’ll see a ring of well-done meat around the outside. It’s because heat is overcooking the outside as it diffuses toward the center. Because of this there’s also something chefs call carryover cooking. Carryover cooking is just heat that continues to diffuse from the outside in after you take the meat off the hot surface. If the outside of the steak is 500F, and the inside is only 130F, it’s easy to see that heat will transfer toward the center, cooking it more. So a chef must actually guess at what temperature to pull the steak off (probably more like 125F) based on the cooking that will happen afterward. With low-temperature cooking, things are much simpler. Thanks to accurate temperature control technology, which is now very cheap, it’s much better to just cook the steak at 130F. Now you no longer have to guess when to pull it out. A simple formula (don’t worry, you can just use a chart or app because nobody wants to do that math) tells you how long it will take to get your steak to the same internal temperature as the heating element. Because you’re cooking it at the final temperature, if you wait a little too long nothing bad happens. The steak will never get hotter than the 130F. Your food is cooked to one internal temperature throughout. Here’s a graphic from Cooking Issues (thought I’d replicate it here before that blog’s takeover by Viagra spammers is complete) showing you the difference. So low-temperature cooking is considerably better. You’ve probably had a ton of food cooked sous vide (one type of low-temperature cooking) and didn’t even know it. Chipotle cooks their barbacoa and carnitas that way. Panera cooks their steak, turkey, salmon, and even their oatmeal that way. High-end restaurants cook many things sous vide, in fact you’d be hard-pressed to find a Michelin-starred restaurant without a rack of immersion circulators. So needless to say, Y Combinator made a smart move investing in the space. I don’t know much about the two specific companies but am excited to see them. That’s sous vide. You can see the carrots are bagged (probably with a little oil) but the eggs shells serve as sufficient packaging. More interesting, though, was Cinder. Cinder is kind of a cross between a George Forman grill and a low-temperature cooking machine. 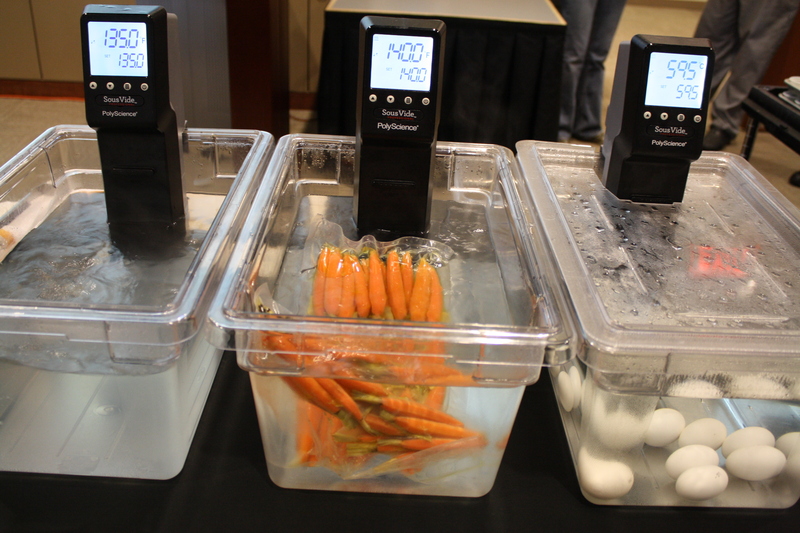 It’s not really sous vide at all, despite using the term many times on its website, it’s low temperature cooking. I have a lot of questions as to how exactly this thing works for many types of meat. But it does look like an incredibly simple way to cook a steak or pork chop! That thing would be really awesome for someone in a situation where a full stove is impractical too. Imagine having that in your college dorm. I have a lot of thoughts about the space in general, having been doing this for a few years. I’ll get more into depth on that in the not-too-distant future.